Beauty and reverie...: An extremely thrifty haul! If you look at the pictures above, would you really believe it if I told you that every single item had been bought for £1 or less? I know I wouldn't but I've been pretty lucky on my shopping expeditions lately! Here is a little guide to the budget haul I've collected where all of these items still left me with change from a tenner! 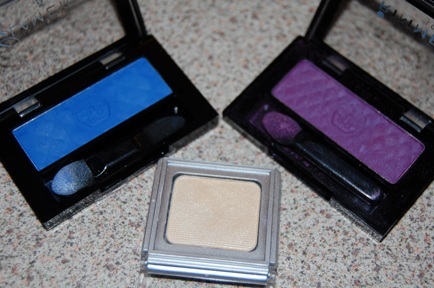 The Rimmel solo eyeshadows and the wet n wild solo eyeshadow were a chance find at Poundland. I'm a great lover of pound shops and when I noticed the various brands that had cropped up out of the blue at my local store I was delighted. Among the racks were NYC, Revlon, MeMeMe and several other brands I immediately started to flap about. However as I was in a hurry, these were all I got! I'm sure I'll be returning soon to pick over the rest of the spoils. 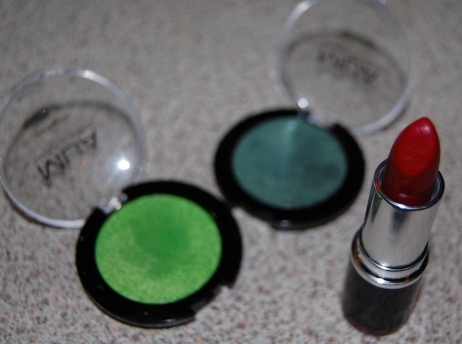 All 3 were exactly £1 each and the cream shade makes a perfect highlighting colour. I'm not sure where I found out about the Peacocks cosmetics sale but I'm glad I did. Whilst bumbling around the store the other day I made my way over to the beauty products that I normally skim over and found two products that caught my eye. 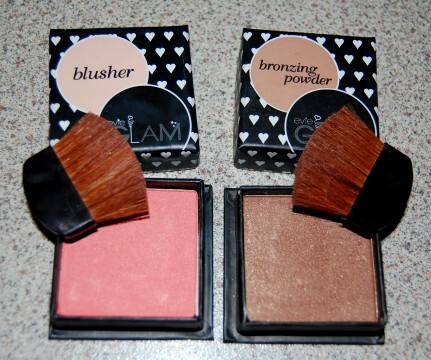 The first was this stunning peachy/gold bronzer and the second a shimmer packed bronzer. My boyfriend picked up the blusher for me which was £1 (reduced from £3) and he even got his 10% student discount off it, making it just 90p. The bronzer we picked up later on for £1. 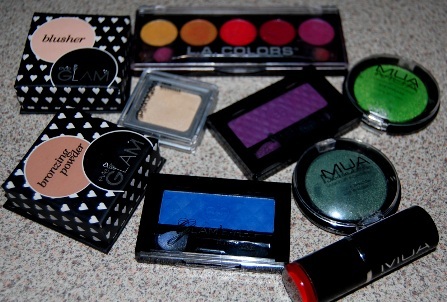 The LA Colors palette came from a store that boasted prices of 99p or less... I'm sure you'll start to see a theme in my shopping habits soon! 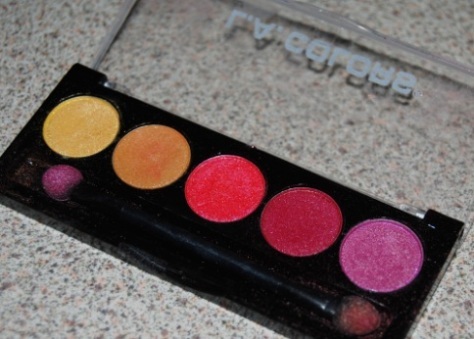 I bought it because I'd been mooning over a Sleek palette earlier that day and wanted to see if I could get equally pigmented bright shades at a much cheaper price. I'm completely in love with this palette and I'm sure it'll get its own review soon as despite the seemingly awkward shades I've been reaching for this constantly! Again I'm going to have to return and pick up some of the other shade selections on offer. The palette was 99p and I've worn every single shade! By now I'm sure my love affair with MUA products is common knowledge. Whilst browsing in Superdrug the other day I couldn't resist expanding my collection of their eyeshadows with these shades (6 on the left and 7 on the right) which go wonderfully together. I also bought their lipstick in shade 1 and while I am still having trouble pulling off deep reds, I bought this to play with. Each product was £1 each. For 9 items I don't think that £8.89 is a bad price to pay. I've had a lot of use out of several of these products so far and the quality has been great. Individual reviews will follow and I'm sure that they'll pop up in future looks. Turns out I can still sometimes haul on a miniscule budget, fantastic! @G A B Y It has a really pretty rosy gold shimmer but it actually shows up very light and actually quite a pale pink. I love it! @Summer I was so surprised at how good it is! @Karen I know, I'm going back for so much more! @Rosh 99p stores tend to do it as well, especially with Rimmel. @Beauty and MakeUp I'm glad you like the look of them! @Laura I'm a bargain fiend at heart so it's doubly lovely knowing they were so cheap!